Accurate diagnosis is critical to precise, timely and cost-effective repairs. You'd be surprised how many shops don't have access to up-to-date software or the training to diagnose vehicles correctly. You don't want to be a shop that wastes time subletting diagnostics or repairs. It adds to the repair length and increases costs, both of which decrease profits and frustrate customers. Instead, ask yourself these eight questions to make sure you can provide highly accurate and timely diagnoses for your customers' cars. 1. Can your diagnostic service access original build data? There's a big difference between generic data and original build data when diagnosing vehicle faults. Accuracy is difficult to assure when manufacturer-specific trouble codes can mean very different things for each carmaker. Choose a diagnostic service that provides relevant results according to a vehicle's make and original build data. 2. Is the information legal and licensed? Carmakers often make their diagnostic software proprietary. Only properly licensed users receive up-to-date information including new model releases and bulletins. Be sure your shop's diagnostic services come from a licensed provider that uses paid OEM subscriptions. 3. Is your shop using a licensed OEM version for vehicle programming? It's never a good idea to use a copycat service or product. Using software that's out of date or unlicensed can cause ECU problems after a reflash or reprogramming. Are you willing to chance compromising a customer's car with inadequate software? 4. How often are OEM updates performed on your diagnostic device? Some aftermarket scan devices add OEM updates in bulk batches, sometimes only twice per year. That can leave huge gaps in coverage, especially if you work on newer vehicles. Plus, those updates can cost your shop nearly $4,000 for the software alone, just to keep your software current. Choose a diagnostic provider that adds updates as they become available and for no extra charge. 5. Is OEM Information Downloaded When the Diagnostic Tool is Connected? Cheap code readers and diagnostic tools simply scan for trouble codes and read live-stream data. That doesn't tell the whole story for an accurate diagnosis. 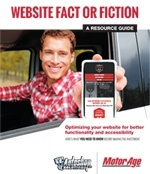 If your diagnostic tool doesn't download the vehicle's OEM information, you could have missing or inaccurate data. 6. Does Your Device Provide OEM Recall and TSB Information Automatically? Recalls are prevalent on all makes and models and technical service bulletins can lead you to required repairs quickly. A high-quality diagnostic tool or service should have the ability to provide recall notices and TSB information automatically, as soon as the device is connected. If it doesn't, reconsider your tool's quality. 7. Is the Technician Trained to Scan and Diagnose Vehicles? Constantly-changing technology and new vehicle features put technicians at a disadvantage. Staying current on diagnostics is nearly impossible while trying to remain productive, unless that's their job day in and day out. It can lead to mistakes or frustrating time delays. The best diagnostic services like asTechTM offer support and diagnosis by Master Technicians, both remotely and on-site. 8. Is There Coverage If You Encounter an Issue? If there's a problem with the equipment or the scan data, you want to know someone has your back. Top-quality diagnostic services provide guaranteed support for their product and the vehicle you're working on so you can stay productive.